LynchyRightNow: The Case For Futbol, Really! Yes, I agree that LynchyRightNow.Com is not the normal house for soccer conversation. No, I'm not a fan of the United States pathetic attempt at professional soccer otherwise known as the MLS or a fan of the English Premier League, nor would I follow any of them at any time. I agree that while soccer may be the most popular sport in the world, it's not even top five in this country. We don't follow Cristiano Ronaldo or Kaka, we follow the likes of LeBron, Peyton, Albert, Tiger, and Sidney. However, watching Brazil v. USA on Sunday afternoon got me thinking that maybe I've been missing something. Even though it wasn't the World Cup, Olympics, or any other event that we really should care about, if the Americans had toppled Brazil in the FIFA Confederations Cup it would have meant something. 1. We're better, it's about asserting it. Yea you know what? I might not give a damn if David Beckham signs with the Galaxy or if the Revolution beat D.C. United, but when it comes to laying the stars and stripes on Brazil, Spain, Germany, or Italy, yes I'm all in. The Americans making it to the Confederations Cup finals and doing so by toppling global powerhouse Spain, puts them not only on the map but forces the world to take notice. A victory over Brazil would have pushed that envelope even further, but maybe the U.S. has other plans. Maybe the World Cup and revisiting South Africa in 2010 is exactly where they will announce their assertion. Assertion is more than just the team with the most expensive threads from the country that defines greatness, assertion as the worlds premier soccer playground. For those who doubt that the American soccer team wants this more than anything, they have this for you: Upon their disappointing 3-2 loss to Brazil 27-year old Landon Donovan had this to say "we're at the point where we don't want respect, we want to win." Sounds like they are prepared to not only act the part, but be the part. 2. Lance Armstrong dominated global cycling, Tiger Woods dominates the golf, and Michael Phelps just clearly dominated swimming. Don't we think it's about time that we take yet another title on yet another global stage? Yes, our basketball players are better than anywhere on the world, but we invented that. No hockey isn't as important, this isn't thirty years ago and we're not in the midst of a cold war. 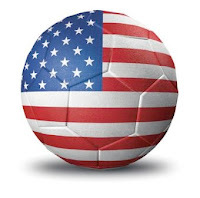 This is today in 2009 with a 2010 World Cup approaching us, it's time you see the United States capture that title and run with it. I'll go one step further, if the United States can win the World Cup, it'll be more satisfying than the 04' Red Sox and more of an upset than the Miracle On Ice. In South Africa the Americans don't come in as a classic underdog, they don't come in as a team with no shot looking to get a little respect. The Americans come in as the runner-up in the Confederations Cup who had the mighty Brazilians on the ropes down 2-0 before relinquishing a lead and ultimately losing the contest. They come in as a team with more to prove than just "happy to be there," but happy and willing to do what it takes to win. This is America baby, we don't like a second place finish.